Stanford won their third straight NCAA title relatively comfortably, but during the meet all the buzz was about how well the Cal women were performing. Stanford are the early favorites next year. A look at the field behind them. 2019 Women’s NCAAs: How Did Our Top 20 Recruits Perform As Freshmen? Taylor Ruck was the big freshman scorer, but all 7 of Stanford’s top-ranked recruits scored at NCAAs as rookies. Meanwhile one of our honorable mentions went off for big points. The 2019 Women’s NCAA Championships had some fantastic highlights. Hear these topics covered in our Top 25 (+1) Quotes from the media room at the 2019 NCAA Championships. Indiana’s Lilly King was almost a second ahead at just the 50-mark in 27.39. She came through the 100 at 58.62, still over a second ahead of the field. She was right on record pace at the 150 in 1:30.58. King was slightly off her record from last season as she finished in 2:02.90 with the 2nd fastest performance ever. 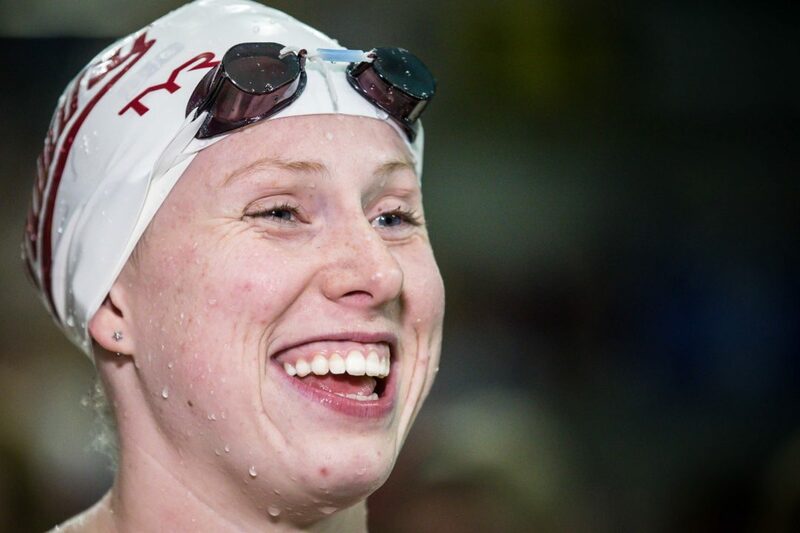 She now owns 6 of the 8 fastest swims ever in the event and a new Pool Record. Texas A&M’s Sydney Pickrem moved up to #4 all-time, clocking in at 2:03.65. That was a lifetime best by a second and the 8th fastest performance ever. Behind her, NC State freshman Sophie Hanssondropped over half a second in 2:06.18 to round out the top 3. South Carolina’s Emma Barksdale(2:06.87) outpaced Kentucky’s Bailey Bonnett (2:06.91) and Indiana freshman Noelle Peplowski(2:06.94) on the back half to take 4th. That was a best by almost a full second for Barksdale, while Bonnett and Peplowski broke 2:07 for the first time as well. Minnesota’s Lindsey Kozelsky (2:07.77), a 2018 finalist in this race, took it out with the lead in the B heat at 1:00.56. Stanford’s Allie Raab closed in on the 3rd 50, taking over the lead down the final stretch to win the heat in 2:06.85. That was a big swim for Raab, who had never broken 2:08 before. Ah, the ever quotable King. Great comments on her teammate and the future. Lilly has been an outstanding competitor. On to Tokyo young lady…. How long until tyr and king announce their deal?